Things are going so fast now, that with every passing day the news on the television and internet are increasingly lining up with Bible prophecy! In light of that I am writing this month about our Watch Therefore Radio and soon to be TV broadcasts. I have a testimony that is very special that I have not shared with most of our partners. It directly pertains to the Poured Out ministry and the opportunity to make disciples in the nations of the world! This new format for my program was to begin on radio and has been airing in Southeast Texas on the Salem Radio Network for about three years. It also is listened to in over 100 countries on Oneplace.com also owned by SRN. So, the Lord opened a door for the radio program Watch Therefore and there are new doors opening here in Israel which may facilitate me coming back on TV but with the Watch Therefore message and format! 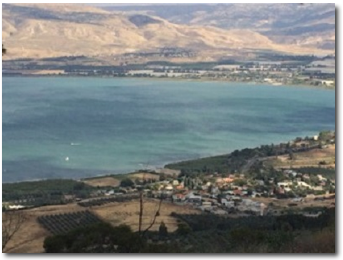 I have an opportunity to record programs with the most beautiful view of the Sea of Galilee that I have ever seen! There is a national TV network in America that is also global by satellite that is interested in the program. The network provides coverage for up to 25 million homes in America alone. This would cost a lot of money, but I figure if it is the Lord’s will-it is the Lord’s bill. Tragically, as it is obvious that our Savior’s coming is more imminent than ever, fewer Bible teachers are teaching this command of the Lord to Watch and be ready. When was the last time you heard this message? So, please pray with me about this incredible opportunity to Watch Therefore and teach others all over the world to be ready! May our Savior richly bless and keep you as we prepare for His soon coming for His people!!! I encourage you to go to Oneplace.com and search for Watch Therefore-listen to our program-may it help you to be ready for our soon coming Savior!